A young boy's awakening to the conflict between innate gifts and social class is at the center of this searing memoir about the unforgiving sovereignty of money Hoping to make a killing in New Jersey real estate, the author's father, Monroe Siegel, takes a draw from his employer against unearned commission. When the recession hits in the 1970s, Monroe finds himself owing a small fortune to his firm. He sinks toward divorce and bankruptcy, while Lola, Lee's mother, suffers a nervous breakdown that turns her into a different person. Shamed and enraged by his father's fate, Lee grows up wondering what society owes a person who has failed materially but preserved his humanity. "Other men got rewarded for their cold-heartedness, and often for their dishonesty, while he, Monroe Siegel, who had never hurt anyone, had to groan and stumble through life. Did not kindness deserve an income?" As a teen, Lee tries to make a different life for himself. He goes to a private college in the Midwest, is forced to leave due to his father's bankruptcy, and returns to New Jersey to work a series of menial jobs. He enrolls at a state college and then drops out to seek a better existence abroad, only to return to the United States in debt and in despair. Suddenly, a promising new life opens to him. At a price. The Draw touches on fundamental questions: How do we balance our obligations to ourselves with our obligations to others? What do we owe society when its rules have a legal basis but not a moral one? 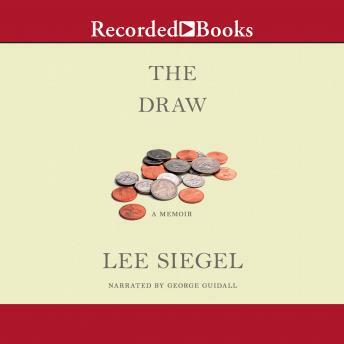 Written with startling candor and psychological acuity, Lee Siegel's The Draw is for anyone who has ever struggled with money, or who has tried to break through the barriers of family and class.